New Delhi, February 5Home Minister Rajnath Singh on Monday condemned the cross-border firing by Pakistan in which four Indian soldiers, including a Captain, were killed, saying he has full faith in the valour of the Indian Army and they shall “give proper reply” to the neighbour.”Have full faith in the valour of our soldiers, and they shall give proper reply,” Rajnath Singh told reporters. Earlier, Minister of State for Home Affairs Hansraj Ahir also condemned Sunday’s ceasefire violation in Jammu and Kahsmir’s Rajouri and Poonch districts saying that it shall “cost Pakistan dearly”.”Pakistan has been violating ceasefire along the LoC. And this year the number of ceasefire violations are high,” Ahir said.”Yesterday (Sunday) also, they again violated ceasefire. We will not forgive Pakistan’s actions,” the Minister said.”The ceasefire violations would prove to be Pakistan’s foolishness and will cost them dearly,” he added.Union Minister for MSME, Giriraj Singh also slammed Pakistan for the ceasefire violations and said, “Have faith in the Indian Army. When the right time comes they shall give a proper reply to them.” Referring to the 2016 surgical strikes, the Minister said, “When the Army carried out surgical strikes it didn’t tell the media about it. Similarly, they shall act accordingly at the right time.” He said India has been following international laws.”There is a Hindi saying in Bihar ‘latkhor’ (addicted to being beaten), and similarly Pakistan is ‘latkhor’ and thus proper reply would be given to them,” he added.The Minister’s remarks came in the wake of the increased cross border firing in the Kashmir Valley.On Sunday, four Indian soldiers were killed and four others were injured in firing in Rajouri and Poonch districts.The killed soldiers included Captain Kapil Kundu, who would have celebrated his 23rd birthday on February 10. Hailing from Haryana’s Gurugram, he is survived by his mother Sunita.The others were Riflemen Ramavatar, 27, from Baraka village in Madhya Pradesh’s Gwalior, besides Subham Singh, 23, from Kathua and Havilder Roshan Lal, 43, from Samba in Jammu and Kashmir. PREVENTION OF CRUELTY TO ANIMALS IS AN OFFENCE SINCE 1960 – WHAT ABOUT CRUELTY TO SOLDIERS ON MILITARY DUTY IN J&K? President of India as the Supreme Commander & the Armed Forces are under oath of allegiance to the Constitution of India; continue to silently suffer ‘cruelty’ in J&K, when it is an offence against Animals but for some unknown reasons, Soldiers continue to suffer, not objected by RM or COAS, except their Children or Parents of the Soldiers. Is RM not responsible to prevent cruelty to Soldiers? Fundamental Duty of all Citizens including Military Officers Article 51A is to bring to the notice of concerned authority, if something is going wrong. 3, Why Rajya Sainik Board of J&K / Kendra Sainik Board of MoD ares keeping quite when Welfare of AFs is on ‘concurrent list’? As a responsible War Veterans request the President of India to protect Soldiers from cruelty of Stone Pelting by issuing Presidential Order please since Political Leaders have failed to en-act Law in this respect. Brig HS Ghuman, SC, Retd. # 1043 Sector 71, SAS Nagar. 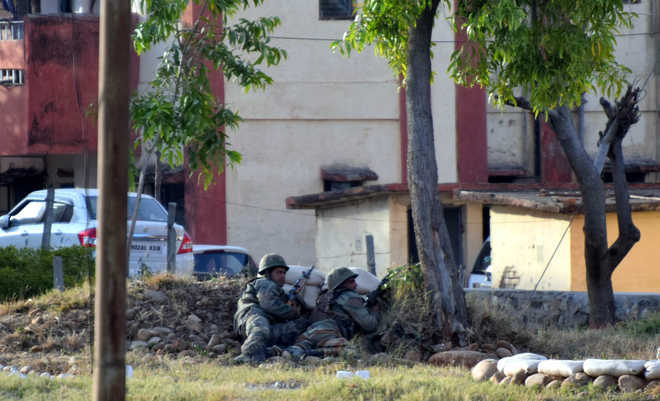 A shootout with some armed gunmen that began when they stormed an army camp in Jammu’s Sunjuwan in a pre-dawn strike on Saturday has left six people—five soldiers and one civilian— as well as three militants dead, a defence spokesperson said. Defence spokesperson Lt Col Devender Anand confirmed three heavily armed militants—suspected to belong to Jaish-e-Mohammad— had been killed. All three gunmen were dressed in military fatigues. There are unconfirmed reports of two more militants being gunned down. Among the 10 wounded are six women and a 14-year-old boy. The latter was hit in the head with a bullet and is believed to be critical. Also among the injured is a pregnant woman who later delivered a baby. Both are believed stable. Search operation at the camp is still ongoing. The defence spokesperson said that security forces found heavy arms and ammunition. A group of heavily armed gunmen attacked the sprawling camp of the 36 brigade of Jammu and Kashmir Light Infantry early on Saturday. Two Army personnel, including a Junior Commissioned Officer (JCO), were killed on Saturday. Lt Col Devender Anand said a number of families were still there and the Army’s aim was to ensure their safety. “There was no firing since last night,” the officer said. Those who were killed have been identified as Subedar Madan Lal Choudhary; Subedar Mohd Ashraf Mir; Ha. Habib-Ullah Qurashi; Naik Manzoor Ahmed; Lance Naik Mohd lqbal . A civilian, Lance Naik Iqbal’s father, also died in the operation. Lt. Col. Rohit Solanki of 6th Mahar; Lance Naik Bahadur Singh of 1st Jammu and Kashmir Light Infantry; Hay Abdul Hamid Rashid of 1st Jammu and Kashmir Light Infantry; and Subedar Rajinder Singh of 6th Mahar were injured. Six civilians were also wounded, among them a pregnant woman. 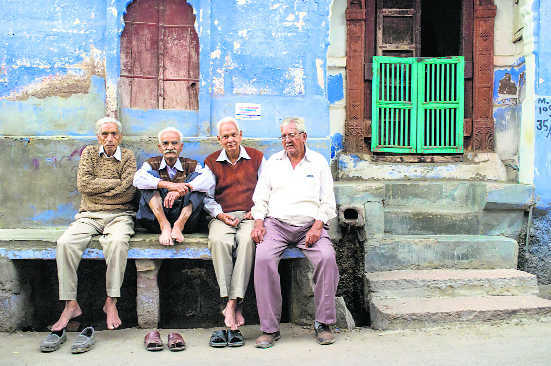 Read: Residents woken up by gunshots, grenade blastsThe latest attack on the camp took place nearly 15 months after the Jammu region was hit by a similar attack. On November 29, 2016, terrorists had stormed the Army’s Nagrota camp on the outskirts of Jammu city, killing seven Army personnel, including two officers. Three terrorists were also gunned down. The terrorists had struck before dawn on Saturday and managed to sneak into the camp from the rear side of the base after a brief exchange of fire with the sentry on its periphery. “The terrorists entered the family accommodation complex after which quick response teams cordoned off the area and isolated the terrorists, who are holed up in a few houses (inside the camp),” officials said. While there was no action around the main entrance and vehicles were moving along the Jammu-Lakhanpur bypass in front of the camp, Army personnel in bullet-proof vehicles engaged in the operation to rescue people from the family quarters in the rear side of the base. Contingents of CRPF and police were posted outside the boundary wall and were keeping curious onlookers at bay to avoid civilian casualties. Intelligence inputs had warned of an attack on an Army or security establishment by Jaish-e-Mohammed in view of the death anniversary of Afzal Guru who was hanged on February 9, 2013. An Army Captain and three soldiers were today killed in heavy shelling by Pakistani troops along the Line of Control in Rajouri district of Jammu and Kashmir, forcing the Indian troops to retaliate. The slain soldiers were identified as Captain Kapil Kundu (22) from Ransika village in Pataudi (Gurugram); Rifleman Ramavatar (27) from Baraka village in Gwalior (MP); Rifleman Subham Singh (23) from Mukandpur Choudharian village in Kathua (J&K); and Havildar Roshan Lal (42) of Ghagwal in Samba (J&K). 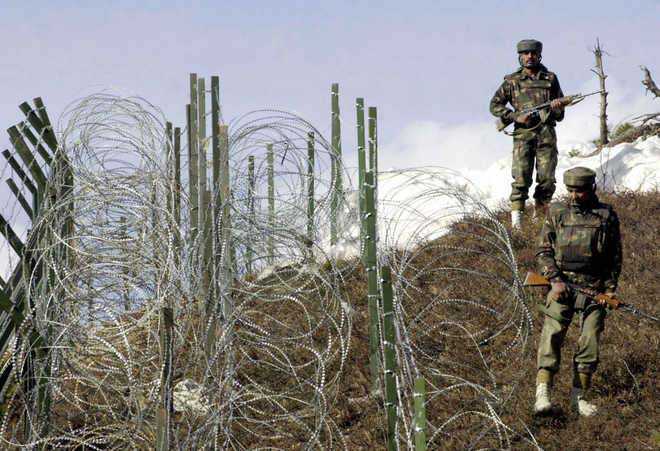 Pakistani troops initiated unprovoked and indiscriminate firing of missiles, mortars, automatic weapons and small arms along the LoC in Bhimbher Gali sector of Rajouri district around 3.30 pm, an Army statement said. “Indian Army retaliated strongly and effectively and heavy damage has been inflicted on Pakistani army posts,” a Defence PRO said. “However, in the exchange of fire, one officer and three jawans were grievously injured and succumbed to their injuries and attained martyrdom,” he added. This is for the first time that missiles have been used this year by Pakistani army to target Indian Army posts. Earlier in the day, a jawan and two teenagers were injured in Shahpur sector of Poonch district in shelling from across the border, which started this morning. The injured civilians were identified as Shahnaz Bano (15) and Yasin Arif (14), residents of Islamabad village. They have been hospitalised. Since January 13, five soldiers have died in LoC firing. On January 13 and 19, Lance Naik Yogesh Muralidhar Bhadane and Lance Naik Sam Abraham were killed in Sunderbani sector. Sepoy Mandeep Singh was killed in KG sector of Poonch. Signalman Chandan Kumar Rai, injured in Mendhar sector, succumbed to his injuries on January 20. Naik Jagdish Kumar, who sustained injuries in the KG sector on January 20, died on January 24. I am a fourth-generation member of an armed forces family, married into a 5th generation armed forces family, therefore, even before I begin my letter I would like to bring to your notice that nothing I say today comes without deep thought and a feeling of seethed agony to see how our brave men and women in the uniform are being treated by the civil dispensation in your state. My letter to you today is written in my capacity as an Army wife and not so much as just another pained citizen of India. I would like to know that despite the countless times the country has demanded evidence from men from our fraternity regarding their effectiveness and humanity, what has been your contribution as a politician and the incumbent Chief Minister in ensuring that troops are looked after in a way that they feel motivated to serve you and “brethren” in the valley despite living a life marred with constant humiliation, stress and a an “awaam” that is not only thankless but also hostile. What steps have you taken to reign in or at least counsel the gentry who leave no stone unturned while comparing a martyr like Lt. Umar Fayyaz with a murderous terrorist like Burhan Wani? Is that not the greatest disrespect to the memory of someone who made the ultimate sacrifice for the Motherland? I would also like to ask you and by extension the Government of J&K exactly how many FIRs the State Police filed when Operation Clean Up was launched in the early months of 2017 to bring back peace in an otherwise upturned valley? Was it convenient then to let the armed forces do their job because your fragile political career depended on it? Or is it easier now to prosecute an entire regiment because you need to win the “hearts and mind” of the stone pelting minority? I am seeking these answers today on behalf of all those women who are sitting far away from the tumultuous events of the valley wondering if today their loved ones are safe from both grenades and stones? And while they are ceaselessly watching your back, I need to know if you are watching theirs? Because, clearly, the events since January 27th are not hinting at a State Government willing to grant our men and women in uniform the support needed to serve their country and the people of J&K with the dignity expected of the Indian Armed Forces. A few months back it was Major Gogoi, today it is Major Aditya, tomorrow it could very well be any of our husbands or brothers, what do we do then? Did it ever strike you as ironical Madam, that the case against Major Gogoi which was so enthusiastically supported by the more liberal factions of our great country, took place during when he was on election duty defending the Kashmiri people’s right to vote, and used his Army Jeep and thinking on his feet found the best possible solution to send a message to instigators of violence that they would not get in the way of the conduct of free and fair elections on his watch. Sure his method was unconventional, but he was pushed into a corner and he worked with what he had and tied the offender to his Jeep to iterate his point, but why did everyone stop at that? Why did no one notice that the Major also ensured that no violence broke out and voting remains unaffected till the very last vote was cast? Major Aditya before being termed a “murderer” in the FIR, is a decorated officer who has proved his mettle during his tenure in the RR with four kills of Jaish-e-Muhammad terrorists to his name. Your State Journalists and Politicians are quick to call uniformed men rapists and murderers, but then how do you explain the need to turn to these very “murderers” when the water rises in the Jhelum and there is panic across the valley. Will you please explain to me that what exactly are our “irrational” men doing in Siachen where even nature has given up? Will you please also care to elaborate the need for the State Government of Jammu & Kashmir to turn to the “marauding” Indian Army to set up Goodwill schools in the valley or run Skill Training sessions for the “Kashmiri Awaam”, because from where I am standing, I see a young world kick boxing champion Tajamul Islam, the student of a local Army Goodwill School, being motivated by our jawans to kick hard and fight like a champion and conquer the world. Is it just us or do you too feel the pride when 9 students coached by the Super 40 Class organized by the Army crack their way into the prestigious IITs of the country? Our men serve the nation without a flutter of self-conscious worry, I have yet to come across an officer or a jawan who would flinch at the news of being posted to the RR, for them that is the utmost honor to serve & protect the dignity of India from where it matters, the Frontlines. But what kind of an example are you setting by prosecuting an officer of the Indian Army who only chose to act in order to save the lives of his fellow soldiers. How come the police hasn’t registered an FIR against the stone pelting blood thirsty mob causing extensive damage to government property and personnel? Do you think you are any less accountable to the wife of the JCO who got hit on the head and was almost set on fire? Is a stone pelting, violence inciting youngster of more worth that the men who seek to protect and empower everyday life in the valley even if it comes at the peril of their own? I would want to know exactly what has been their contribution towards the constructive social upliftment that hasn’t already been undertaken by the Army? This is the same Indian Army, Madam, which pulled out a terrorist at the end of an encounter and took him to the hospital despite suffering fatalities of their own. Or have you chosen to forget that? Of course you have. What is it about their selfless service and unparalleled commitment to the nation that scares you, your administration? Need I remind you, that it has been a result of the relentless presence and action of the Armed Forces that tourism has managed to make a comeback in the valley, where the bulk of your economy depends on tourists from across the country and beyond. Do you for a second feel that they would feel safer in the presence of your recently pardoned stone-pelters than they would knowing that there is an Army outpost nearby looking after their security. It took the likes of Bollywood close to two decades and more, to feel “safe enough” to return to Gulmarg for work, making it possible for your state to reclaim its spot as a favoured tourist destination. Now I really hope Madam, that you alone are not taking the credit for the booming pony business in valley, after all, the visitors are relaxing only because there are those silent ADP marches, ROP routines taking places somewhere in the backdrop. I can assure you, Madam Chief Minister, it takes a certain amount of courage to sit by the phone every day waiting for the call to come in assuring us that all is well where our men are posted, but it takes even more gumption for most women from our fraternity to live with the knowledge that someday that call may not come. So, I need to know from you just what are you prepared to say to all the women sitting away from their loved ones when things go south and it was your action that let those men down. 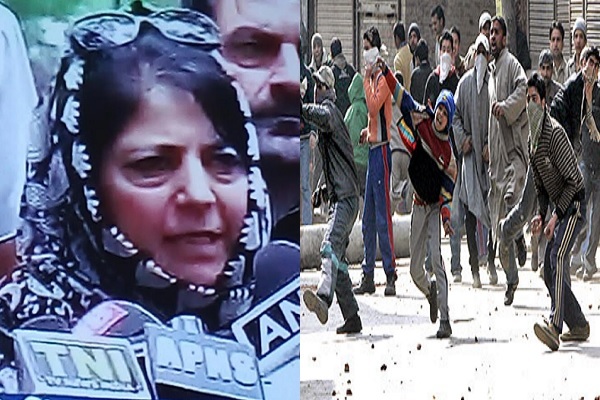 I would like to know from the administration of your state exactly how do you justify to the 70,000 plus men who made Operation Rahat a life saver for the citizens of the valley and beyond, that their hard work counts for nothing compared to your efforts to appease 2000 odd stone pelters, who I am sure will not think twice before lynching another policeman outside another mosque or try to set ablaze another olive green vehicle because in their eyes their government understands their murderous intent but does not acknowledge the dedication of the men sworn to guard you all with their lives. These men too have a life beyond the borders, they too have families and aspirations of their own. And as someone who has grown up with olive green in their blood, I demand that you tell me how is my brother or a brother officer expected to fight with dignity for your safety when you will not even give him the scope to protect his own life and those of others who look up to him as their leader, and are willing to take the bullet should the need arise. You may feel the need to write to the Central Home Ministry if a terrorist is getting ill-treated in Tihar Jail, but how many times have you tried to write a heartfelt letter to the father of Captain Saurav Kalia who was tortured and killed because he chose to remain loyal to the nation till his last breath. Madam, you have a lot of soul searching to do and I hope the next time you feel safe enough to venture out on a political rally, you remember to thank the men who keep you safe even as you decide to walk all over them. It is indeed shameful that you are choosing to prosecute a brother officer for not giving in to a diabolical crowd. It is indeed ironical that in a week where J&K has seen FIR filed against Major Aditya and his unit for firing in self-defense, today, i.e 31 January, falls the birth anniversary of India’s first PVC Major Somnath Sharma. Major Somnath gave up his life while defending the same Kashmir from Pakistani rapists and ravagers, in short, the Pakistan Army which had attacked Kashmir on 22 October 1947 and was on the doors of Srinagar. Jinnah and his army had taken advantage of Maharaja Hari Singh’s clever by half attempt to make Kashmir ‘Switzerland of the East’ and made a vicious attempt to grab the state by force. Major Somnath had landed with his Kumaonis while his arm was still in plaster courtesy a hockey playing injury. 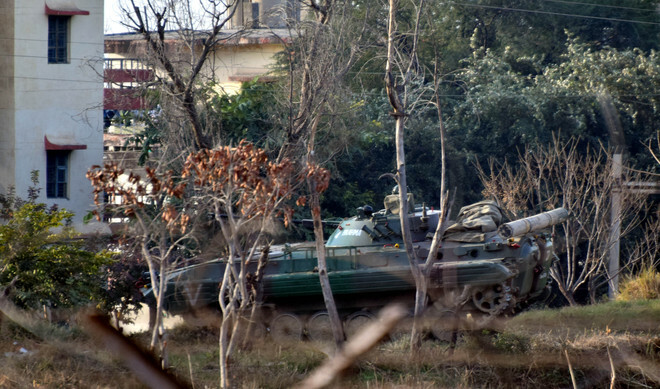 It was in Budgam where his company took on the Pakistani army despite being outnumbered 7:1. Major Somnath and his company fought like lions with exemplary leadership from him with even the plaster not being hindrance to bravery. The Kumaonis inflicted heavy casualties on the enemy notwithstanding the losses they themselves suffered. Major Somnath was grievously injured as a mortar shell fell on their ammunition storage spot. His last message; “The enemy are only 50 yards from us. We are heavily outnumbered. We are under devastating fire. I shall not withdraw an inch but will fight to the last man and last round”, has passed on to military folklore. The bravery displayed by Major Somnath and his company saved Srinagar airport from falling into the hands of Pakistanis and kept India’s lifeline into the state, functional. That we failed to take back PoK in 1947-48 was political failure for which the country is still paying a heavy price. That the same Kashmiris whom the army saved from Pakistani savages have been brainwashed into throwing stones at their protectors and filing FIR’s show that religion has been abused to spread hatred. But all this does not in anyway lessen the sacrifice made by Major Somnath Sharma and it is our duty to ensure that these sacrifices do not go in vain. : The Param Vir Chakra is India’s highest military decoration for acts of conspicuous gallantry in the presence of the enemy. The father of Army Major Aditya Kumar had moved the Supreme Court seeking quashing of the FIR against his son. 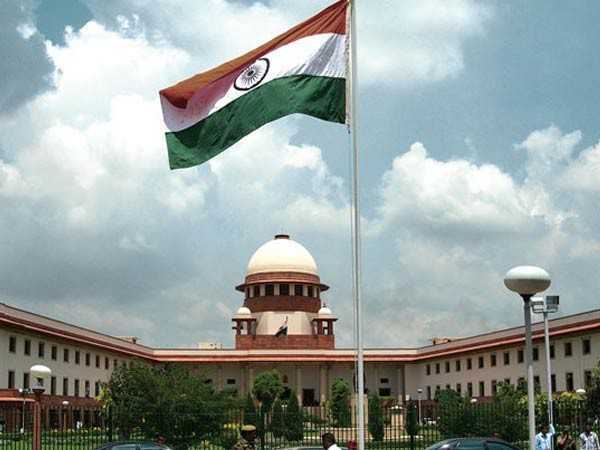 The Supreme Court on Monday stayed all proceedings in connection with an FIR registered by the Jammu and Kashmir Police naming Major Aditya Kumar as an accused with regard to Shopian firing incident. A three-judge Bench headed by the Chief Justice of India — which had on February 9 agreed to hear the matter — also directed that no coercive measures shall be taken against Major Aditya Kumar. The Bench issued notice to the Centre and Jammu and Kashmir Government and asked the petitioner — Major Aditya Kumar’s father Lt Colonel Karamveer Singh to serve a copy of his petition to the office of the Attorney General to enable him represent the Union of India. The order came on a petition filed by Major Aditya Kumar’s father seeking quashing of the January 27 FIR against his son. The petitioner was represented by senior advocate Mukul Rohatgi while Attorney General appeared for the Centre. Besides quashing of the FIR, Petitioner Lt Colonel Karamveer Singh has sought guidelines to protect soldiers’ rights and adequate compensation for them. Two civilians were killed when Army personnel fired at a stone-pelting mob in Ganovpora village in Shopian, prompting the chief minister to order an inquiry into the incident. The FIR was registered against the personnel of 10, Garhwal unit of the Army, including Major Kumar, under the Sections 302 (murder) and 307 (attempt to murder) of the Ranbir Penal Code. The Army had on February 1 presented its version of events contradicting the police FIR. It reiterated that soldiers opened fire on protesters in “self-defence” to prevent imminent lynching of an officer, snatching of weapons by villagers and burning of the Army vehicles. The petitioner contended that FIR had been illegally filed against Major Aditya Kumar. In his petition, Lt Colonel Karamveer Singh has contended his son had been “wrongly and arbitrarily” named in the FIR as the February 27 incident related to an Army convoy on bona fide military duty in an area under the AFSPA, which was isolated by an “unruly and deranged” mob pelting stones causing damage to military vehicles. “The petitioner is constrained to file the present writ petition for quashing of FIR, directly before this court in view of the extremely hostile situation on the ground, whereby an FIR has been registered by local police against the son of the petitioner, who is a service Army officer and was performing bona fide duties as directed by the Union of India,” read his petition. He urged the top court to lay down guidelines to protect rights of soldiers and adequate compensation so that no Army personnel is harassed by initiation of criminal proceedings for bonafide actions in exercise of their duties. He also demanded registration of FIR against those involved in terrorist activities which caused damage to government property. The petitioner said the intention of his son — a Major in the 10 Garhwal Rifles — was to save Army personnel and property and the fire was inflicted “only to impair and provide a safe escape from a savage and violent mob engaged in terrorist activity”. The unruly mob was asked to disperse and not to obstruct military in performing their duties and not to damage government property but when the situation reached beyond control, a warning was issued to disperse, the plea said. As the unruly behaviour of the “unlawful assembly” reached peak and when they got hold of a Junior Commissioned Officer and were in the process of lynching him to death, warning shots were fired fire to disperse the violent mob and protect public property, the petitioner submitted. Singh also referred to last year’s incident of a mob lynching of DSP Mohd Ayub Pandith to highlight the situation in the troubled state and the condition in which Army officials were working to control violent mobs in Kashmir. CHANDIGARH: A joint meeting was held on Friday between the officers of the Air Force and mayor Davesh Moudgil in the office of Air Officer commanding in chief (AOC) 3 Base Reserve Depot (BRD), Chandigarh. The problems being faced by Air Force were discussed in the meeting. The Air Force authorities informed the mayor that there are huge quantity of malba in Air Force houses in Sector 31 and 3BRD Station. Davesh Moudgil directed Ankur Bansal, sub divisional officer, MC, to co-ordinate with the Air Force authorities and intimate them about designated places for lifting the malba. The Air Force authorities requested the mayor for cleaning the vegetation in the Air Force Houses in Sector 31. The mayor directed MC chief engineer and XEN, horticulture, MC, to take requisite action. The mayor assured the Air Force authorities that an open air gym will be started in Sector 31 within 6-8 months. On the request of the Air Force officers, mayor directed the chief engineer and director and executive engineer, horticulture, that horticulture waste be lifted from the affected areas. The mayor also directed the concerned officers to ensure proper water supply in the area and also to take care of the open drain opposite main gate of Behlana village. The mayor also directed the officers to look into the other problems of the residents of Sector 31, who are mostly Air Force employees, on a priority basis.